Product prices and availability are accurate as of 2019-04-06 11:58:06 EDT and are subject to change. Any price and availability information displayed on http://www.amazon.com/ at the time of purchase will apply to the purchase of this product. The light weight Septor LED Headlamp with elastic adjustable head strap features (7) ultra bright 100,000 hour life white LEDs for wide task lighting and three power modes. It is also equipped with a low battery warning indicator. Water resistant and impact resistant. With seven, ultra-bright, white LEDs, the Streamlight Septor LED Headlamp features three levels of lighting for a wide range of applications including up-close detail work and long-range viewing. Adjustable straps help secure the light to any head size, and a 90-degree tilt mechanism allows you to point the light exactly where you need it. 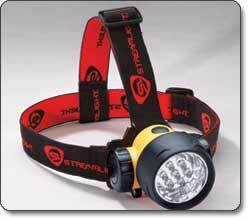 Durable and water-resistant construction ensure extended use, and the Septor Headlamp runs on three "AAA" batteries (included). The adjustable elastic head strap wraps around and over the top of your head or cap for a secure fit. View larger. The rubber head strap ensures a nonslip grip for hard hats. View larger. 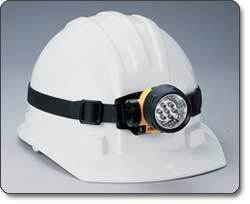 Weighing just 4.72 ounces, the Streamlight Septor LED Headlamp fits comfortably to your head with the included rubber hard hat strap, leaving your hands free to perform electrical work, set up a tent, look under the house, consult a manual, and more. You can use the Septor Headlamp anywhere you use a regular flashlight, but you'll have both hands available to perform the task at hand. 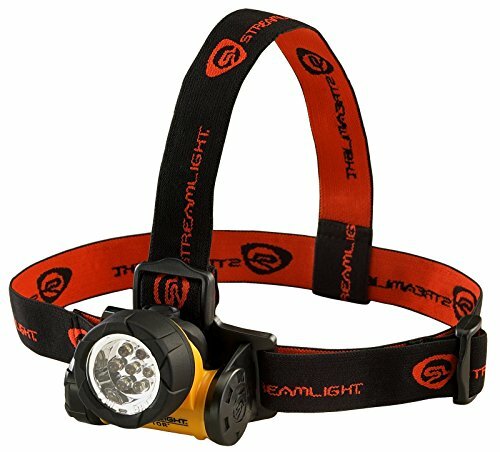 This headlamp produces 50 lumens of light with seven LEDs, 25 lumens with three LEDs, or 9 lumens with one LED. It has a run time of up to 150 hours on three "AAA" batteries (included). An LED is ideal for lights that are used often and over an extended period of time. You don't have to worry about breaking the light, since there is no glass or filament, and you rarely have to replace LEDs because they can last a lifetime. Save time and money on batteries as well--they will last much longer with an LED than with a regular light bulb. The Septor Headlamp uses seven, super-bright, 100,000-hour LEDs, so you'll never need to replace a bulb again. Protected by an unbreakable polycarbonate lens, the seven LEDs provide 50 lumens of light for distance illumination. You also have the option to use three of the LEDs for medium range lighting or a single LED for short range lighting. Designed for convenience and ease-of-use, the Septor Headlamp features a push-button switch at the top of the unit for quickly turning on and scrolling through the settings--first illuminating one LED, then three, and then all seven. The head tilts down to 90 degrees, reducing neck strain and allowing you to focus the light as needed. Made with water-resistant thermoplastic construction that is virtually indestructible, the Septor Headlamp comes with an adjustable elastic head strap that wraps comfortably around and over the top of your head or cap for a secure fit. A rubber head strap is also included and ensures a nonslip grip for hard hats. 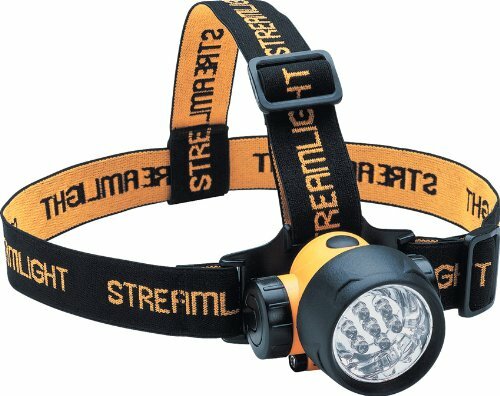 The Streamlight Septor LED Headlamp is backed by a manufacturer's limited lifetime warranty. 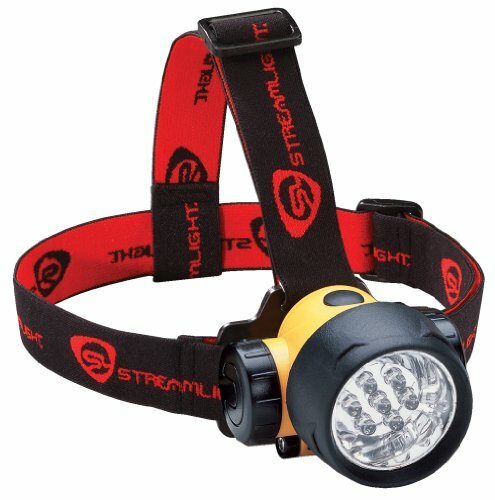 Streamlight Septor LED Headlamp, three "AAA" batteries, rubber hard-hat strap, and elastic head strap.